According to the results of the ZinCo tests, the power output of a solar module increases by about 4 % as a result of the cooling effect of a green roof. The measuring equipment on the test roof: In the foreground, Modules 1 and 2 on the bitumen membrane and in the background Module 3 on the green roof. The weather station for measuring air temperature can be seen beside Module 3. Thanks to the green roof on the InCenter building in Landsberg/Lech, the solar facility there generates additional earnings of approximately 14,000 Euro per year. It is now generally accepted that the combination of green roofing and photovoltaic systems provides numerous synergy effects: for example, the weight of the green roof serves as a structural weight for anchoring the solar module. The design allows for load distribution right across the roof, therefore avoiding point loads which would be created if concrete elements were used for anchorage. In addition, it is much more difficult to transport the concrete elements up to the roof area. The green roof substrate, on the other hand, can be easily piped up to the roof. Furthermore, there are still unanswered questions regarding a certain increase in earnings with photovoltaic systems as a result of the cooling effect of green roofs, something that was to date not measurable. ZinCo set about providing the proof and has measured this effect with its own testing equipment over a period of three years. Solar modules are electric components with which power output dips with increasing temperature because of the increase in electrical resistance. The standard performance of a solar module is stated by the manufacturer in reference to 1000 Watt/m² irradiance at 25 °C cell temperature and an air mass (AM) of 1.5 and is specified as maximum power output in Watts Peak (Wp). This test procedure which is used internationally is referred to as standard test conditions (STC). It corresponds to the weather conditions on an early summer day in Germany in brilliant sunshine. The temperature coefficient for the output shows how the power output changes per Kelvin deviation from the standard test temperature of 25 °C. This coefficient depends on the product and is approximately 0.5 %/K. This means, for example: A solar module heated up to 65 °C, whose maximum power output is 200 Wp, will generate 0.5 %/K x 40 K = 20 % less output. Therefore, only 200 W – 20 % = 160 W of electricity will be generated. The key question for ZinCo is now: How great are these differences in temperature in reality, that is, how great is the actual cooling effect of a green roof? In order to find an answer to this question, ZinCo set up a measuring system on a test roof and over the following three years continuously recorded test values. The test facility consists of three identical solar modules installed in the same location, faced in the same direction and at the same tilt. Modules 1 and 2 are installed on a bitumen waterproofing membrane (one on a low and the other on a high mounting frame). Module 3, on the other hand, was installed on an extensive green roof and on a high mounting frame. A total of 27 sensors measure continuously, among other things, the cell temperature at the underside of each module. In parallel, a weather station measures the current air temperature, wind speed and irradiance. On this basis, temperature differences can be ascertained during the test period, as required, in relation to individual hours, days, months or years. It was generally established that the temperature of Module 3, installed on the green roof, remained closest to the air temperature, while the Modules on the bitumen membrane were considerably warmer. In order to express in figures the extent of the cooling effect due to the green roof, the measured values from the year 2010 were analysed. The result is a difference of, on average, 8 K between the temperature of Module 3 and that of Modules 1 and 2. That means, therefore: With a temperature coefficient of 0.5 %/K, the solar module on the green roof generates a higher output of 0.5 %/K x 8 K = 4 % compared with a solar module on a bitumen roof. Depending on the size of the solar facility, this increase of 4 % in output can be significant in financial terms. 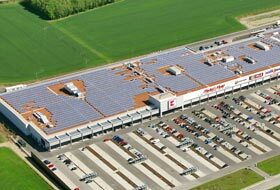 If you consider a solar facility the same size as the one on the InCenter building in Landsberg/Lech, the calculation looks like this: If there was no green roof, the actual 800,000 kWh of electricity per year would not be generated but about 4% less, equivalent to 32,000 kWh. In line with the power purchase tariff for the year 2008, this would amount to a loss of 32,000 kWh x 0.4398 Euro/kWh = 14,073.60 Euro to the investor each year. With a facility generating about 14,000 kWh, e.g. 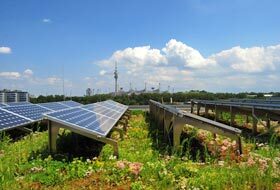 at Fair Energie GmbH, also from the year 2008, there is an increase in earnings of 560 kWh x 0.4675 Euro/kWh = 261.80 Euro each year as a result of the green roof. 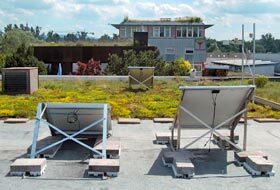 Thanks to the ZinCo tests, it is now possible to quantify the extent of the cooling effect of a green roof on the above-mentioned approximate 8 K as an annual average and to put a figure of about 4 % on the resulting increase in output of a solar facility. These figures are proof: Green certainly pays!